The third category of carpets is the “workshop” area rugs. A “new era” of rug weaving tradition and workshops began in the early 15th century in Persia during the Safavid Dynasty. The art of weaving received tremendous support from the royal families of Persia during this time, as weavings were used for fine pieces for their palaces and as gifts to foreign visitors to the court. This provided major support for the new tradition and encouraged the artisans to produce some of the best rugs in the world. The pieces that were weaved during the period of 1500 to 1700 are the greatest treasures of individual and museum collections around the world and the period is considered the “Golden Age of the Great Carpets”. The most expensive carpet ever sold was indeed from the golden age of the weaving from, the city of Kerman woven in the 1600s. It was from the collection at the Corcoran Gallery Collection in Washington DC. Four individual collectors competed in an auction to raise funds for the museum conducted by Sotheby’s in London, resulting in a winning bid of $33.8 million. The artisan workshop rugs are generally known by the name of the master weaver and the owner of the workshop. 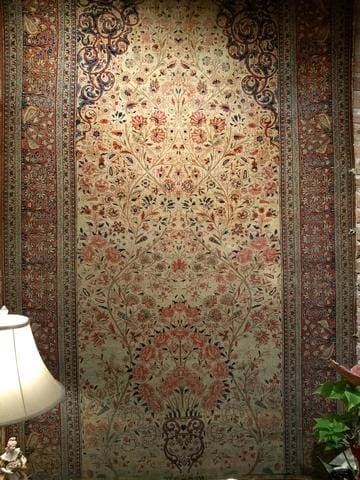 Some of the greatest rugs weaved in the mid-1800s to early 1900s in Persia were from the workshops of Haji Jalili in Tabriz and master Mohtasham in Kashan. The city workshop of Kerman and the town of Ravar (Lavar) also produced some of the greatest pieces from that period. In the late to mid-1900s, the artisan workshop of Master Haj Agha Reza Seirafian And Seven Sons among worlds best known Persian rug producer in the city of Isfahan and the workshop of master Habibian in the city of Nain produce some of the best carpets in that period.